At the height of the boom, indirect, cyclical property taxes – stamp duty, capital gains tax and VAT – were contributing17% of the total tax intake, up from 5% in 1998 (see figure 1). Revenues from stamp duty on all property transactions were c. €2.98b in 2006 alone, up from 387m in 1998, and there were c. €3.2b in VAT receipts. 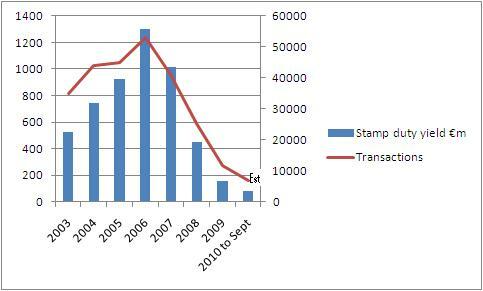 Residential stamp duty in 2006 was €1.3bn on 52,901 transactions. Since the height of the boom these taxes have fallen off a cliff. A piece in the Irish Times yesterday (no online version) revealed that in the 2010 the residential stamp duty take will be less than €100m, a fall of 92% from the peak. Residential transactions liable for stamp duty is set to fall below 10,000 in 2010 (see Figure 2). The fall in stamp duty is clearly due to a slump in both house prices and sales, and also a change in the constitution of buyers, with around 50% of those buying at the minute being first time buyers (who are not liable for the tax). Non-residential stamp duty has suffered a similar collapse and combined residential and non-residential stamp duty now only accounts for 0.6% of overall tax receipts. What was a minor, but significant, contributor to the overall tax intake has withered away to insignificance due to its cyclical nature. Relying on indirect forms of taxation, such as stamp duty, is a folly because they are cyclical. Direct forms of property tax, in contrast, have the benefit of being sustainable and robust to the boom and bust cycles of the market. They might not be popular, but they are necessary if we want to minimise the depth and severity of this and future fiscal crises. The abolition of property taxes for short term political gain was political vandalism – they should have been reformed or restructured to make them equitable, but not taken off the books. The present debate concerning the re-introduction of property taxes needs to move from being whether to do so, to what forms of property tax will be introduced and whether they will include primary residences or only second, investment and commercial properties; whether those that have paid huge sums of stamp duty in the last number of years will be included, or included on a phased basis; how to deal with asset rich/income poor households or whether households below certain income thresholds or certain benefits will be included, etc. Yes, any property tax will be deeply unpopular, but it will be sustainable and non-cyclical and it has to be better than the austerity measures we are presently suffering. Not introducing them suggests a lack of political will to take unpopular but necessary decisions address the present crisis head-on and create a more robust taxation system. The stamp duty slump illustrates perfectly the fiscal problem if we stick to present policy. Please don your “I am not worried” hat! Before this depression is over, they will have adopted just about every tax known to history! After a decade of discussions, implementation will suddenly be a priority! Hi Rob, very interesting and of course relevant to the property tax debate. Can I ask you where you sourced historical residential property stamp duty statistics (€ and volumes) – I understood stamp duty was only reported in an aggregate way (that is including all sources of stamp duty). Also is there really a source for the quantities of homes bought and sold? Figure 1 is from our Haunted Landscape report. The data is in the excel spreadsheet – http://www.nuim.ie/nirsa/research/documents/a-haunted-landscape.xls, tab 19. The data is from Davy Research and the Dept of Finance. Figure 2 data is from yesterday’s Irish Times who quote the source as Revenue Commissioners and DEHLG. Revenue Commissioners must have details of the number of properties from which stamp duty derived since they collect the duty (and one presumes those that were exempt). Land Registry must also know how many deeds transferred ownership as well (but whether they report it is a different matter). Many thanks Rob – I didn’t think residential stamp duty and property transactions were publicly available stats. The DoEHLG statistics site (link belo) refers to completions, commencements, mortgage drawdowns but there is no mention of transactions (which will be both mortgage and non-mortgage based). I have asked them what information is available in light of the IT article. As you say the Revenue should have data on all transactions – making it public is another matter, though I have also asked them for whatever information underpinned the IT article. From your chart it seems that volumes are holding up (if you take the 2010 to Sept figure and extrapolate that for 12 months) compared with 2009. The stamp duty value seems to have roughly halved (again extrapolating Sept 2010 for 12 months ) and comparing with 2009. First time stamp-duty exempt buyers might account for the fall. As I say interesting information which I didn’t know was publicly available. Actually Rob, I don’t think the information presented by you from the IT is correct. According to the Irish Banking Federation there were 9200 mortgage approvals for transactions (as opposed to mortgage approvals for top-ups or equity release) for Q1 and Q2 of 2010. Your graph shows transactions to September at roughly that level. Some of the approvals won’t translate into sales but it would need 50%-plus to fail if your figures (which you have taken from the IT) are correct.But in addition to mortgage transactions there are non-mortgage transactions (never seen estimates though I do know there are roughly 800k extant mortgages in the State and roughly 2000k homes (even if 350k are empty)). So I don’t think the transactions shown by you include non-mortgage transactions which begs the questions does the stamp duty € include non-mortgage transactions. As I say I don’t think total transactions and residential stamp duty have ever been made public. 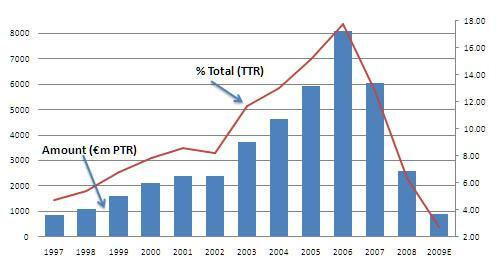 The Revenue has provided me with the stamp duty and transaction figures from 2003 and the IT seems to be correct. The Revenue stress that the figures exclude exempt transactions – so all first time buyers and “as the majority of new houses purchased are exempt from stamp duty – only new properties in excess of 125 square metres for owner-occupiers or new properties purchased as investments are liable to stamp duty”. So one way of widening the tax take on transactions would be to change the exemption rules – why should first time buyers be exempt? Given that we’re not building very much any more why exempt new houses? This strategy is being parroted by those that support the status quo. It is closing the stable door when the economy has gone over the cliff. At the end of 2010 it has been estimated that at least 300,000 homes will be in negative equity because of gross financial mismanagement of the economy. Not to mention ghost estates, which range in number from 650 upwards with figures as high as 2000 being mentioned. Any effort to squeeze more money will simply lead to default on a grand scale which will drive the banking system further into bankruptcy, it one can go further into bankruptcy? I think it can be achieved! The tax payer now own all the banks save our small 36% stake in BoI. We will then have to turn around and make further provisions for delinquent loans on the books of our nationalised banks. Remember, Mr. Lenihan has now changed the rules so that loans for less than 20 million stay on the books of the banks. Moody’s are now looking at the collateralised debt obligations attaching to these loans, which is right. More houses being repossessed more oversupply further suppression of house and apartment prices. Do you not see the vicious circles? I see a vicious circle within a cowardly circle within a politically and morally bankrupt circle. The government and this generation are straining at the leash to transfer the debt to the next generation. If you die in debt you have lived a higher standard of living than you earned that difference between what you received and what you earned is paid for by our children. Why? Well, in short, because we are too greedy and morally decrepit. Really, a more pertinent question might be why are hundreds of thousands of people “lecturers included” being overpaid by as much as 100% in comparison to the UK equivalent jobs? Also, what about the unfunded 116bn contingent liability outlined by the Comptroller General for public sector pensions? Unfunded is the key word! Maybe, we should reintroduce the light tax or window tax that was once used to extract money by the Crown? Seems there is little if no difference between it and the Harp. Soon we will have people removing roofs so that their property is not counted as a house any longer. Sound familiar? It certainly is in our history. Perhaps people throughout the public and semi state sectors should be put on substantially lower salaries? Then tax on water and roofs etc may be avoided, lessened or eliminated. Perhaps parents should take their children aside and tell them “the facts of life” i.e. the reason I get paid so much, is because you and your little sister are going to be paid so little. Alternatively, the reason you are going to be taxed so high is because I was paid so high. People who paid stamp duty should be given a tax credit against paying tax on their property and the interest on that element of their mortgage should also be tax deductible. Remember, in the vast majority of cases this stamp duty had to be borrowed by individuals and families and now forms part of their mortgages which need to be paid back over 20,, 30, 35 years. Now Rob, your idea is that they same idiots should have to pay an annual tax on their roofs. People should take to the streets when the government try these stunts. I think we are going to have to disagree on this. Your basic argument is that because the tax system was underpinned by poor principals in the past/now we should maintain that in the future and try and fix it by slashing public sector salary. We need to fix the tax system. That means introducing taxes that are equitable, progressive, broad based, sustainable and immune to external shocks. Property tax needs to be part of that. As I’ve said above the debate needs to be about the form and parameters, and that might include a sliding scale around stamp duty contributions and ability to pay etc, but that shouldn’t be used as an excuse to maintain a tax system that is not robust to external shocks and allows people to shelter wealth building in assets (which property does over the long term and whilst some people are in negative equity the vast majority of homes are not – 36% are owned outright, and any bought before 2002 are worth more than paid for) from taxation. Introducing property tax is not closing the door after the horse has bolted, it is part of a strategy to make the fiscal position of the state more robust and sustainable into the future. This is why Ireland is an outlier in tax terms (there are very few countries that do not have property taxes). The debate about pay is a separate issue – about lowering the fiscal bill. Whether the fiscal bill is lowered or not, we still need a robust taxation system. If you can provide an argument as to why we should continue with inequitable, non-progressive, narrowly based, non-sustainable taxes that are open to external shocks (that doesn’t conflate issues) I’ll be interested to hear it. I notice everything is “progressive” when it conflates, broad taxation with maintaining the status quo. The logic is that it is good to maintain the status quo while purporting to be acting out of a desire for equity. That is just self serving stuff. if we are able to maintain sovereignty, then by necessity, we will have to operate within feasible parameters we have to look at our society as it is ugly and all that it is. It is easy, but reckless, to impose solutions that ignore underlying causes of the structural deficit, not to mention underlying causes of our banking and property collapse. I live in Ireland not elsewhere and I am sick of academics pointing to systems abroad but forgetting to tell us about how we are being ripped off for energy, cost of services. Is it to be a raft of taxes for lousy inefficient services? Now, we all know besides David McWilliams and Morgan Kelly, that using property as an unproductive asset, as a measure of our societies wealth, as a store of wealth, as a sink for borrowed money is stupid in the extreme. This economic failure is a reflection of societal failure and of mass greed. We will not fix the economy without re-engineering these values. That is the silver lining in this crisis. Morality is back on the agenda greed disguised or undisguised is going to be outed. It is short sighted and lazy to go after property taxes and water taxes in the middle of one of the most serious recessions the country has ever experienced. It will cause another 40,000 job losses. Many of the societies that have these taxes have proper public transport systems, health and education delivery systems, more stable economies less unemployment and crucially less public and private indebetedness. If we are going to deflate then we are going to destabilise and If that goes on for a further 3 to 4 years in the manner suggested, we will end up not the new Iceland but the new Argentina. Taxes for once are going to have to fall on those in society that can afford to pay and the quick fix is gone. Priming is being attempted but the counter effect is dramatic in terms of morale, lack of spending and higher saving. Next, people will start to withdraw deposits and savings from this economy and they would be right from what I have seen so far. Regarding raising taxes this is not a zero sum game there are plenty of weapons in peoples options. There should be an immediate freeze on any wage or salary increases for government workers. Finding money will mean increasing corporation tax, lowering the Public sector pay bill by an average of 20% Maybe capping salaries and pensions. Any savings from so-called transformational agreements must accrue to the exchequer, not unions. It will require careful radical new management of the natural energy resources of methane, wind, wave/tidal, small hydro. It means reigning in our ESB monopoly. We as a people must benefit from our oil, gas, minerals, forestry, agricultural land and water (sea and fresh water). We have only scratched the surface of using our marine resources. It means bringing more farmers into the tax net and giving the self employed the same rights as those working in the public sector and semi state sector. Tourism would be increased in the morning if Terminal 2 was not run by a quango but handed over instead to Michael O Leary in return for flying in millions of tourists to the country. That is the choice for this terminal, have it as a white elephant or call it the Ryanair terminal. I digress! As you more than possibly anyone in the country knows, we have from 350,000 to 400,000 housing units unoccupied. Do we tax these? NAMA has its own agenda to create more, will we tax those too? Do we tax property where the mortgage is seriously under negative equity and where people are hanging on by the skin of their teeth or courtesy of temporary tracker mortgages? Do we tax apartments where people are already paying a management fee of almost 1,800 a year? If so, we create a further incentive for people to give up and seek social housing. Supply of empty units will increase and when NAMA sells it is going to have to sell cheaply, losses will be crystalised and NAMA will be seen for what it is. How can you fix a tax system if we still have poor governance, lack of transparency, (NAMA SPV) computer systems that do not link up, ubiquitous over remuneration, thousands in jobs based on political affiliations, cronyism and quango building? Where exactly is this “progressive sustainable taxation system” going to come from? It will not happen. It is a pipe dream to go along with all the other commissions of taxation unless we re-evaluate, re-calibrate and radically alter the way we do things as a society. The robust system we need must be underpinned by fairness and equity. If it incorporates these two basic concepts then it will have a chance of survival maybe even success. That is what I am demanding and I am not giving my support to anything less. These are just a few of my little thoughts. So your strategy to try and gain the same is not to have the same kind of tax system? How does that add up? How can you achieve these if you do not generate sufficient taxes to provide them? Or are you arguing that we shouldn’t have these things? Or that we should have them, but not have to pay for them? Or they’ll be better provided by the private sector? I agree about tackling cronyism, clientelism, corruption, inefficiences, etc. But that should be in tandem with tax reform, not instead of it. Ireland followed the path of fractured, ‘commonsense’ and unregulated neoliberalism during the Celtic Tiger boom. That’s at the heart of the problem. As I keep saying, the tax system has to be structured in such a way that it is equitable, but you seem to want to ignore that and argue that no-one should pay property taxes regardless of circumstance, etc. You still want to conflate fiscal spend with how we raise taxes for that spend. They are related but separate issues. Even if you reduce the fiscal bill, you still need to raise money for that bill. I’m still of the opinion that it is better to do that with robust, sustainable taxes. Again, I disagree for all the reasons above. We cannot simply cut our way out the problem. Additional sustainable taxation has to be raised. But I wouldn’t worry too much, none the politicians have the courage to try and introduce them even though the vast majority of them know we need them. While the argument about Stamp Duty’s flaws is certainly correct, I think it’s important to query what the best method of property taxation is. Site Value Taxation would tax the land value, not the building value, so, as well as having the standard reliability, also has important effects in discouraging speculation on land as an asset. Since this is an entirely unproductive method of making money, a charge on land-holding seems fair and reasonable. And, since SVT charges all zoned land, it will draw in the holders of undeveloped land, allowing for the burden to be spread more fairly. With this increase in payers, there would be enough revenue to allow multi-annual exemptions for those who purchased at the height of the market.